Geology Glacial drift over the Middle Limestone. 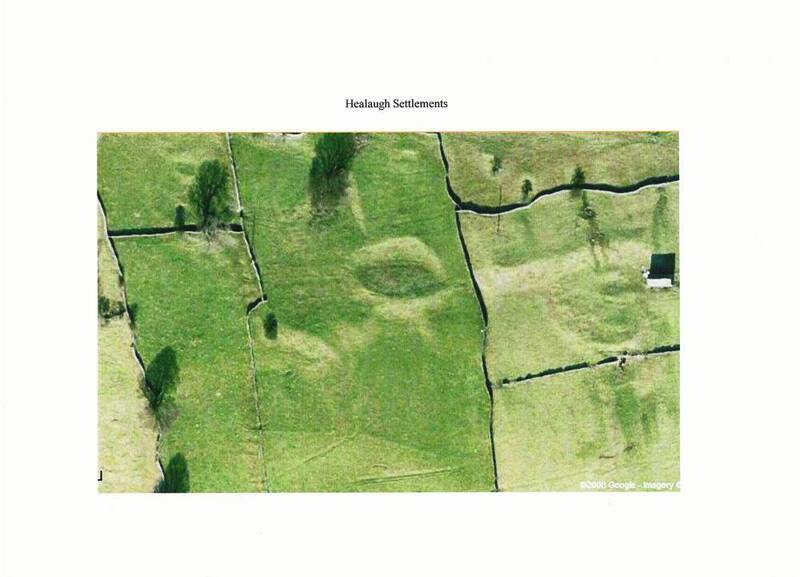 Record Description This record will provide an overview of the settlements, including the excavated settlenent at SE02059827,Site 1 on attached survey, together with the associated lynchetted field system located within steeply sloping pastures to the east of Healaugh. A selected area of a larger survey will be discussed here. 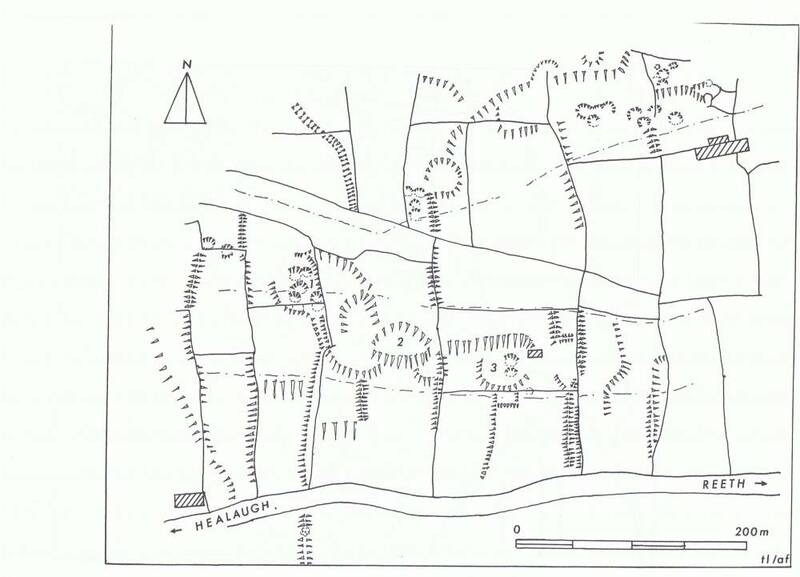 This overview is of a selected area of the Healaugh Pastures and does not extend to include the pastures immediately north of Healaugh as yet unsurveyed, neither does this survey include the pastures further east, below the deserted Riddings Farm. 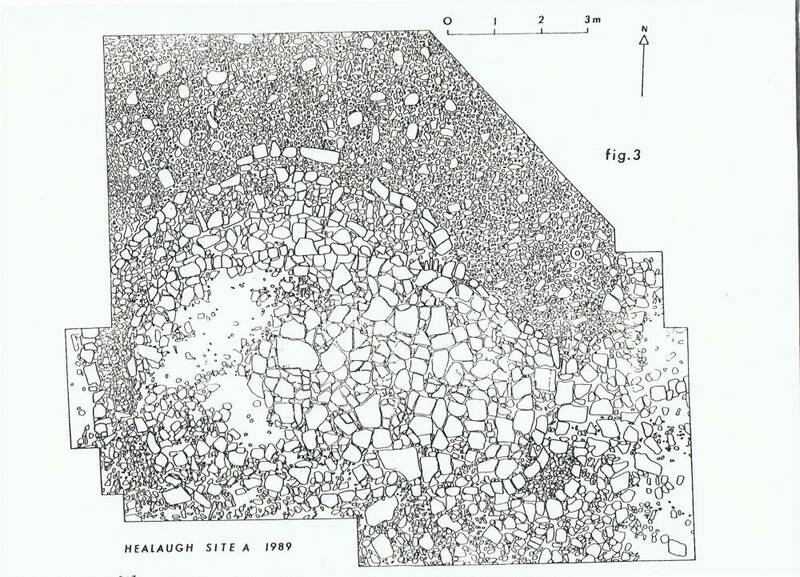 For the full extent of the Healaugh pastures surveyed within the SWALB Project, see Fleming 1998 Figure 9.7. 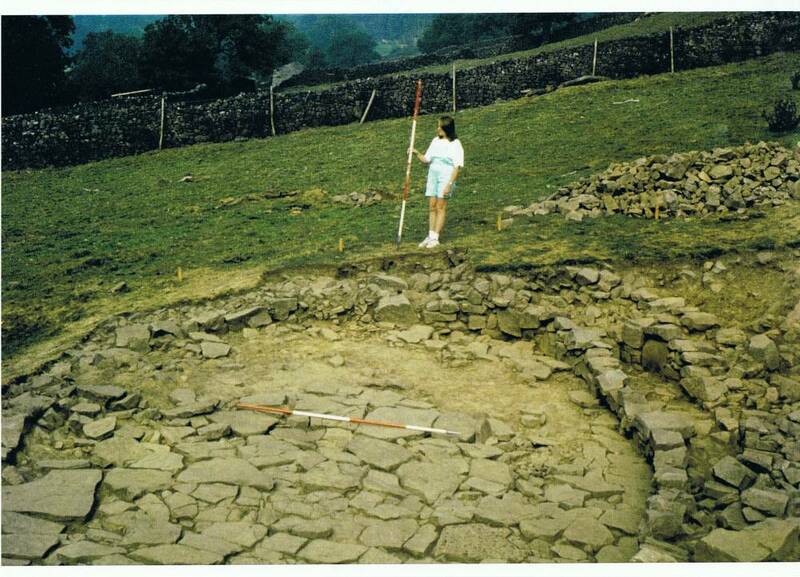 Finds from the excavations, which were removed to Sheffield for storage, have not been figured within any of the Interim Reports, included small amounts of roman pottery (including an amphora handle) from the two stone built phases, native brigantian pottery from the 'pit' feature, a fragment of a D section opaque white glass bangle,a bronze split finger ring, several beehive querns and a saddle quern reused in the paving of the hut. 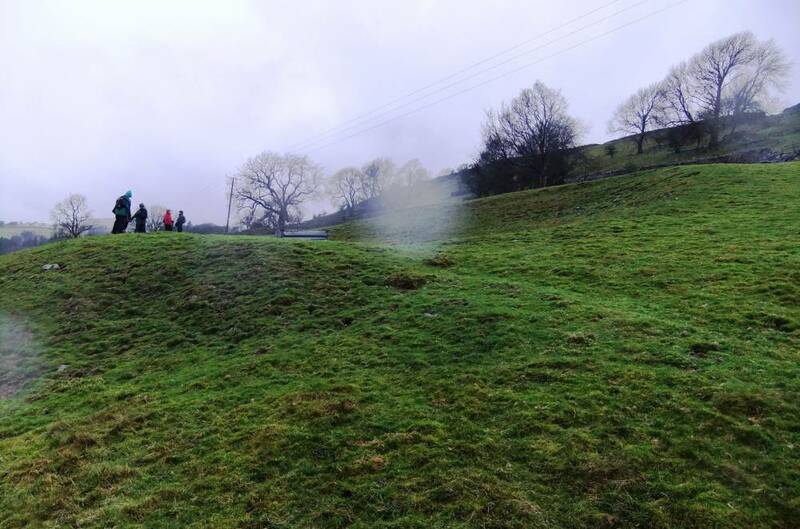 I always regarded the pit feature as a dump deposit resulting from clearance of the occupation deposit from the foor of the early pre-Roman timber phase 1. 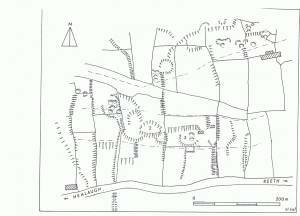 Additional Notes The association between the settlements which have been dated to the Late Iron Age and Early Native Roman Periods and the lynchetted field system which extends downslope to the Swale Flood Plain is of exceptional interest. 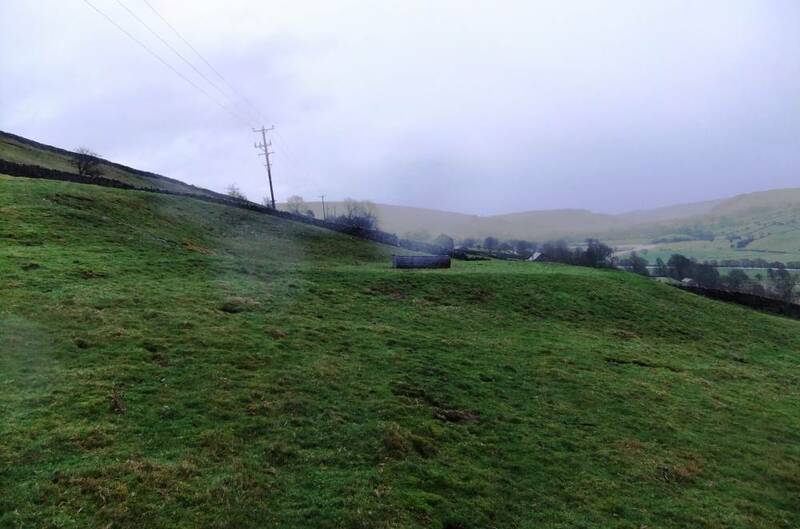 The strongly lynchetted field boundaries which everywhere abut and do not cross the settlement platforms and enclosures, points to Late Iron Age origins for the lynchetted hillslope field system.For details and chronologies see Swaledale Ancient Land Boundary Project Interim Reports Nos 5,6 and 7, 1988-1990, and Fleming 1998. However, there can be little doubt that this early field pattern was sustained and observed during all subsequent occupations. 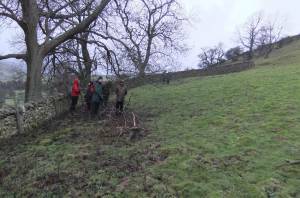 Probably for the reason that the fields are well laid out and have proved to be best suited to the pastoral management of these steep slopes. At any rate, the present day drystone walls of the Late 18th and Early 19th C. enclosed fields are all sited at the top of the earlier lynchets. 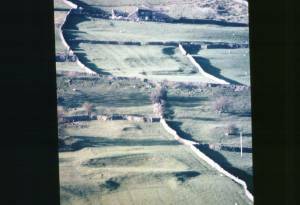 I have always been of the view that the lynchets were formed by cultivation,as usually understood, by the process of ploughing (cutting) against a boundary on a slope, however there are also grounds for believing that these lynchets could also have formed through stock trampling over a very long period, ie since the Iron Age. 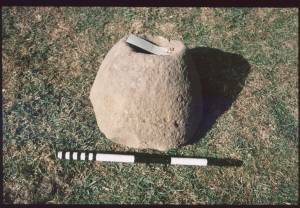 The presence of a number of quern, millstone, fragments on the excavated settlement confirms the processing, if not the growing of cereals during the Iron Age. 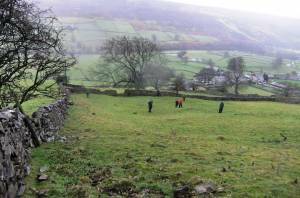 Cultivation up and down slope of such steeply sloping fields needs some consideration on the methods used. 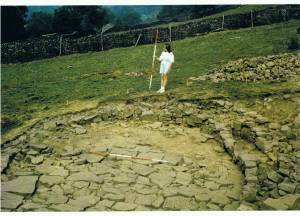 These excavations were directed by Andrew Fleming during three consecutive three week seasons from 1988-1990. 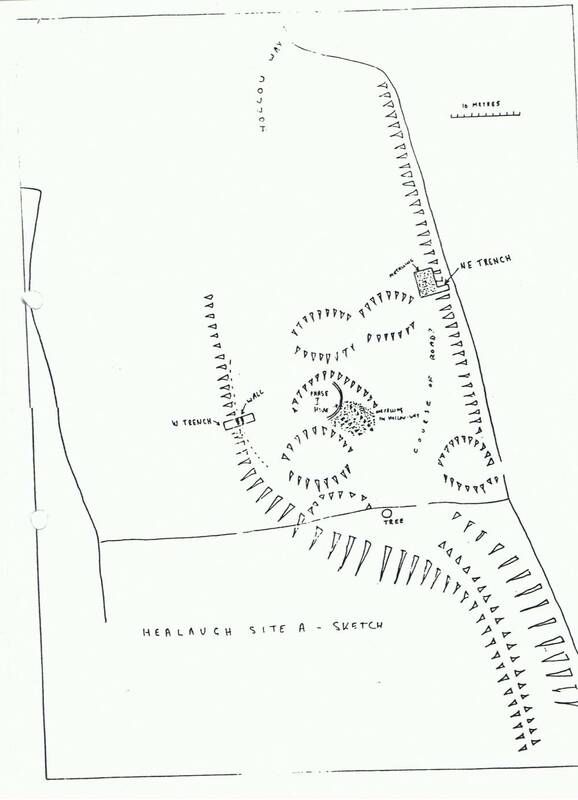 The scope included the single house platform with selected trenches through the enclosure wall and eastern lynchet at Healaugh illustrate the absolute necessity of opening up the whole of the platform so that the complete structure is revealed at each Phase. 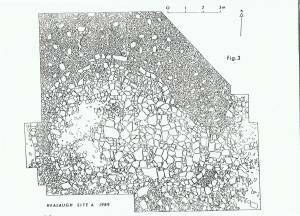 Andrew Fleming recorded the plans of each of the three seperate Phases before proceeding to the next Phase. 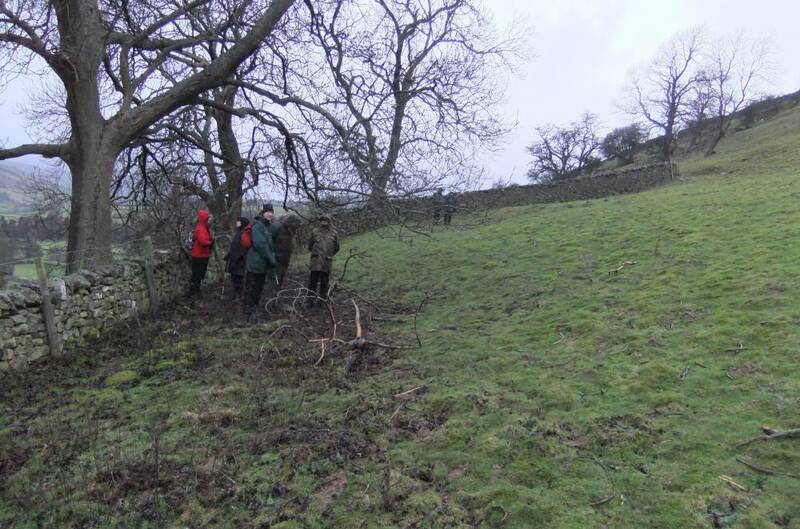 Each Phase taking One Three Week Season. It should be assumed that all settlements are likely to be multi phased with several re-occupations. These phases cannot be recognised unless a sufficient area of a settlement is examined, if necessary over several seasons. Image 2 Description Google. Historical Imagery. Healaugh Pastures. 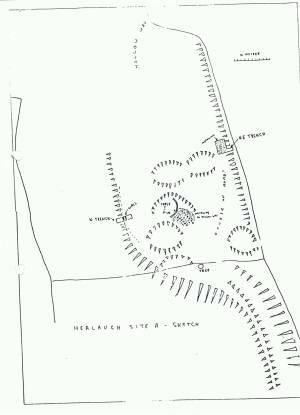 Settlement Sites 1,2 and 3. 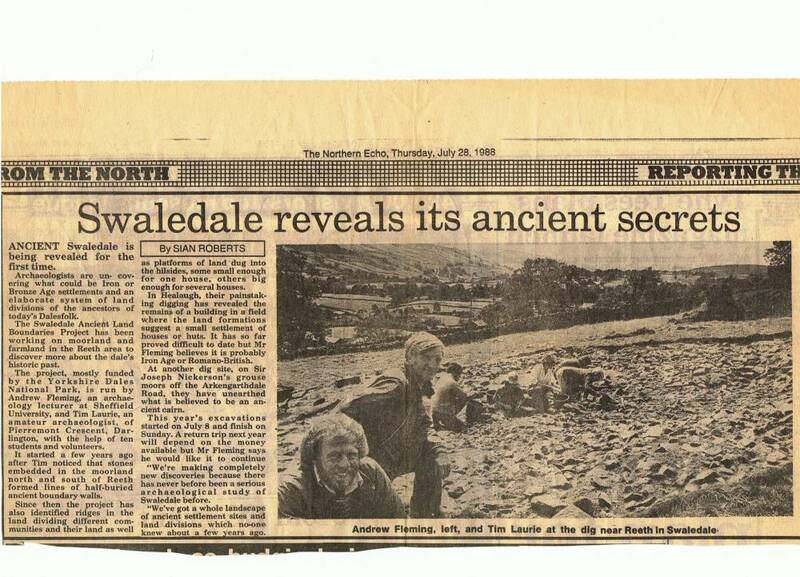 Image 3 Description SWALB Site 1. 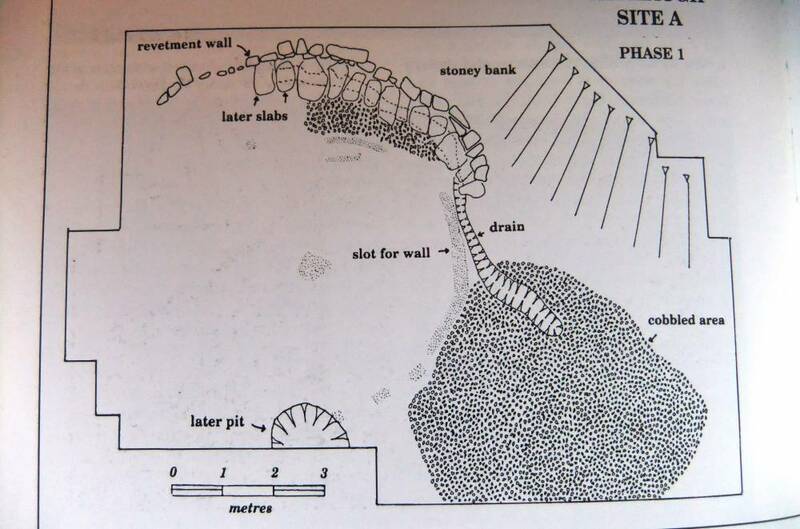 Site Plan showing Phase One Ring Groove House an areas of cobble paving. 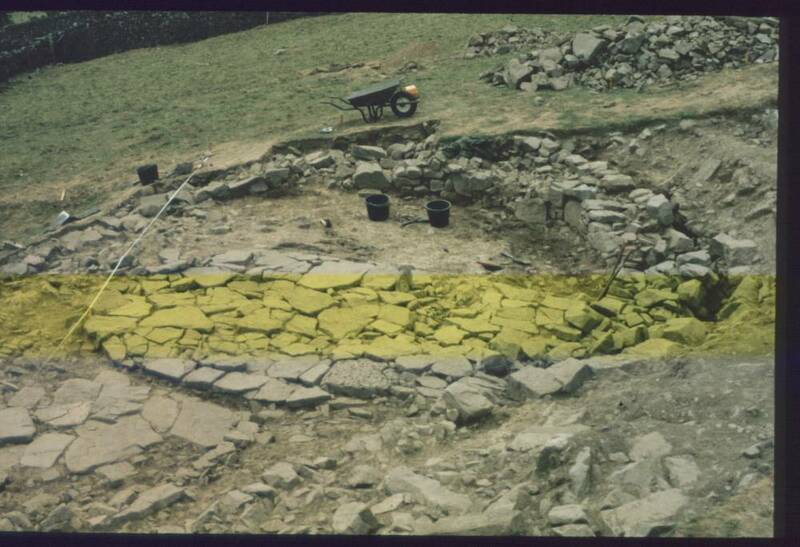 Note the similarity between the areas of cobble paving to the yard and to the hollow way and the areas of cobbling located at the recent West Hag excavations.. 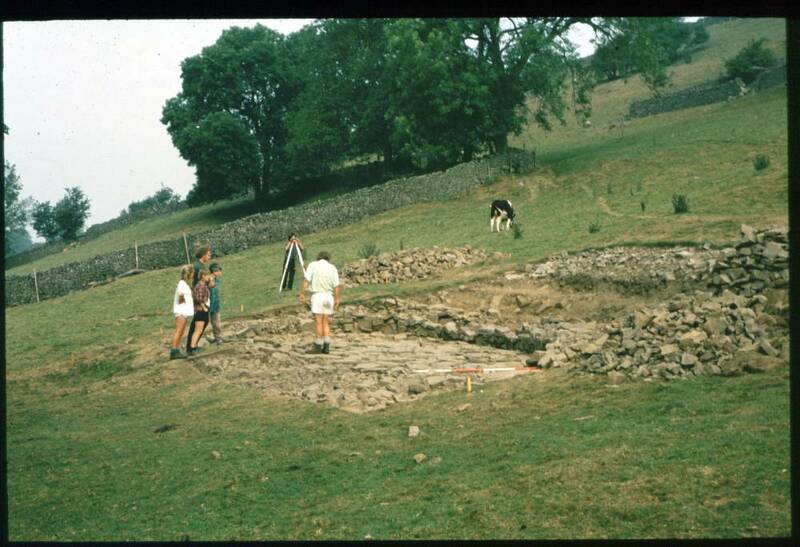 Image 5 Description Excavations at Site 1 at end of Second Season 1989. 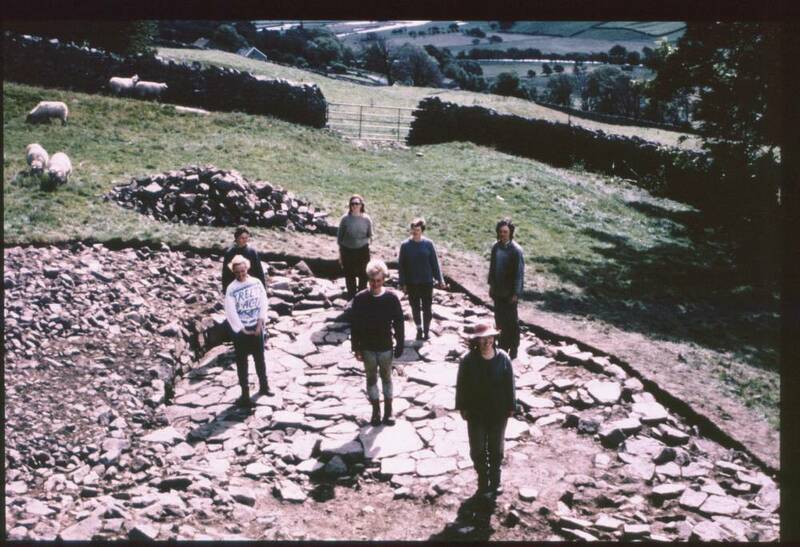 Note the slight wall which converted the Phase 2 Round House to the Phase 3 Oval House. Image 7 Description Site photos of the Phase Three Oval House. Image 8 Description Site Plan, Healaugh Phase 1. 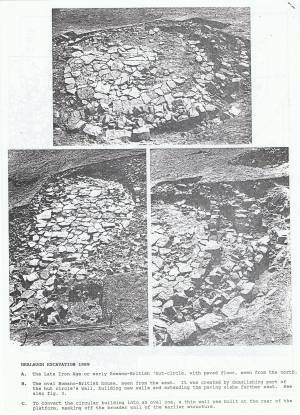 Early timber ring groove house with drain, later pit and areas of cobble paving. Image 9 Description Excavations in progress during the second season. 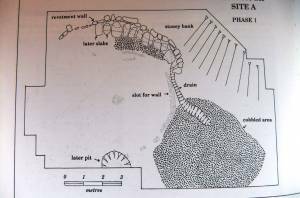 Site Plan before removal of the Later Phase Three Oval House blocking wall to reveal the earlier Phase Two Round House and entrance pathway. Image 10 Description Site 1. Excavations in progress during the second,1988 season. 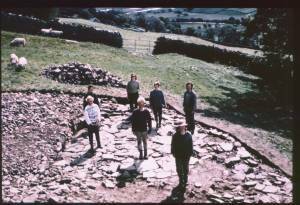 Note that the first season of three weeks excavation was devoted to opening up the whole area of the house platform. 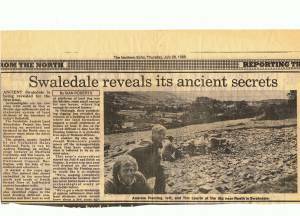 Image 11 Description The large beehive quern found within the scree above the entrance to the house. Several other beehive fragments were recovered during excavations. A saddle quern was incorporated within the floor paving. 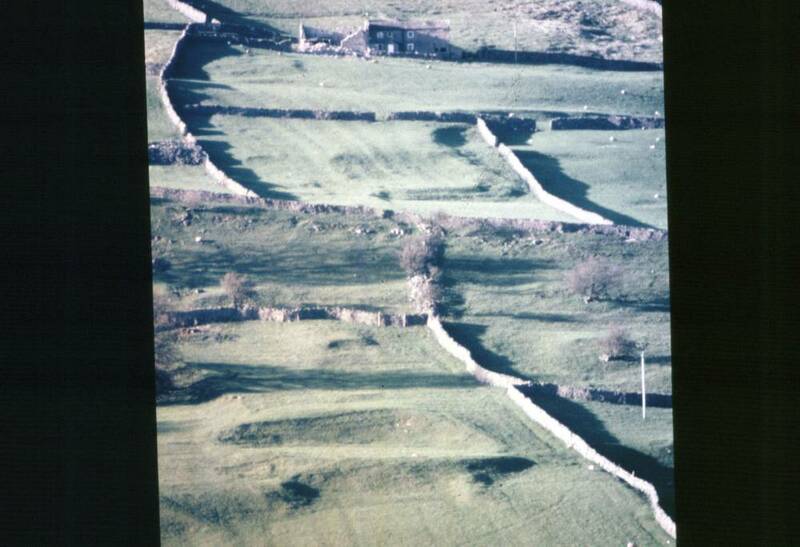 Image 12 Description Settlement Site 2 and the Upper Settlements (all unexcavated), photographed from the Harkerside Road. Image 13 Description Andrew Fleming inspects the excavations in progress. 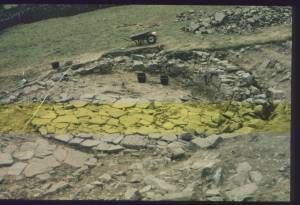 Image 15 Description Two isolated house platforms in pasture above and to the west of Site 1. Image 16 Description Site 2. Settlement platform photographed in the rain. Image 17 Description Site 2. 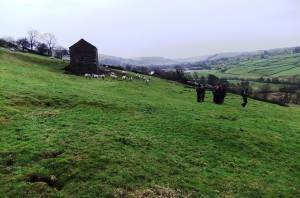 Settlement platform photographed in the rain.